​How do I know that you are a real psychic medium? I’ve been doing psychic readings in the Tampa Bay area since 1998. I was a psychic reader at the Temple of Love and Healing church and the Temple of the Living God church (both in St Petersburg) for over 15 years. I enhance my skills by studying at top psychic schools and by attending classes and workshops taught by well known psychics and mediums -see my About page. About a third to half of my business is repeat clients and referrals. ​So go by your intuition. If you sense a connection and feel I might have something for you –follow up on it. If you are still unsure about me then I’m probably not the right psychic or medium for you. ​Is an in-person reading better than a phone reading? ​No difference. Both are equal in intensity and depth. I can connect with you as if there were no physical distance between us. Do you use Tarot cards in your readings? ​I do if you ask for them. I have dozens of beautiful Tarot, Angel, and Fairy card decks. I don't use them much, though, since I read intuitively and sense your energy. What is the difference between a psychic reading and mediumship reading? ​A psychic reading covers what’s going on in your life –love, relationships, career, life purpose, future possibilities. A mediumship reading is where I connect to someone that has passed. See my Readings page for more detailed explanations. Are you always able to connect with a person that has passed? ​No medium can guarantee to connect you to a particular person who has passed. But so far I have been blessed to usually make that connection. If the person doesn't come instantaneously, then just providing me with their name and relationship should make it happen. Please read the Mediumship section on my Readings page to understand how the process works and what to expect. What if you can’t read me? ​It is a rare occasion when that happens. I’m usually pretty quick to pick up what is going on in your life. We can turn to the Tarot cards also to see what they reveal. What if you see something ominous in my future? ​What I share with you is delivered from a very positive perspective, and I want to emphasize we will be talking about future possibilities. These possibilities are dependent on how you act or react to the current events you encounter. Life is fluid, not rigid. Nothing is written in stone. You have the ability to make the necessary changes that will benefit you on your journey through life. And know the angels are there to help you make those changes if you allow them. Can I ask questions? Or should I remain quiet? ​Give me some guidance, relax, and let’s see what comes to me. Images, people, places, feelings will start to flow. It is best not to interrupt the flow until after it slows. Then will be a good time for those questions. Can I bring a friend to the reading? I find it best that it be just you and I. Another person's energy and experiences can interfere with what I'm sensing about you. An exception would be for biological parents that have lost a child. ​Yes, an audio recording is fine. Many cell phones have an app to record conversations. I talk fast and cover a lot of information. It will help to review all we discussed. Do you remove curses? Can you cast a spell? ​No. I don’t do that. By scheduling an appointment with me you agree and understand I am not a medical expert or attorney and cannot give legal advice or medical diagnosis. My services are not a substitute for professional medical, financial, or legal counseling. You must be at least 18 years of age to book any service with me. One of my favorite churches is the small Greek shrine to St Michael in Tarpon Springs. Whenever I'm in the area I like to stop and light a candle and spend a few moments in prayer there. I love the beautiful paintings, icons, and stained glass windows of Archangel Michael in the church. Over the years the church has become a destination for those in search of a miracle. 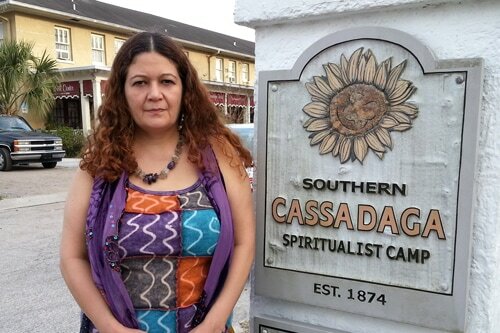 ​Another place I love visiting is Cassadaga, just north of Orlando. It's a historic community of spiritualists, mediums and psychics and is known as the "Psychic Capital of the World." They have a historic hotel, a good restaurant, and a great book & gift store.